[Originally published in The Tokyo Noticeboard]. You go to a world without English to teach it, and write in it. The television is not in English and not interesting, except maybe for the commercials and variety shows because they are always well and truly over the top. For ratings: the pretty girls in very short skirts; For yuks: at least one middle-aged salaryman in blonde wig and a very short skirt. You never watch these shows. You glimpse them. One, two, three minute glimpses. You barely flip anymore. So videos: You join the thousands of foreigners around Japan frequenting the video shops stocked chock-a-block full with the latest Hollywood candy. You realize you are tired of candy. Often you find yourself at the video store comfortable to just kill time, browsing up and down the aisles, leaving the store having not rented a thing. You start reading more. You pay exorbitant rates, like 2500 yen a paperback because they are imported. Yet you buy more books in this one year than any before. You borrow books from other teachers. You acquire books when those same teachers leave the country. In turn, you pass on all the books you know you will never lug home. Thus your library is a modern library, an exercise in minimalism. You think you are cool, sitting on your couch looking at the carefully selected books you have lined up on your desk. You realize you are a nerd. Still, you are more inclined to rent movies. Reading is still a chore in your mind but you like it when the books are good. When the books are good it doesn't feel like homework. The more you read the more you realize they aren't often good. You re-read the good ones. You eat at the same fast food places. You rent old movies. 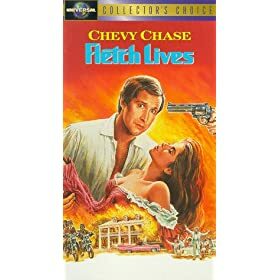 You wonder why your video store has copies of 'Fletch Lives' and 'The Karate Kid part 2' but doesn't carry the originals. You pine for those originals (for 'Fletch' really, though you have a strange and persistent longing to hunt down a copy of the original 'Karate Kid,' to see if it is one of those lucky few childhood movies that stands the test of time). You learn that 'Back to the Future' is a classic and that 'Stand by Me' is not as great as you remembered. This way, folks, for Nerd in Japan Part II.